Residents of Princeton and Area are invited to attend the Public Forum on Medicare on June 4 at Riverside Community Centre, beginning at 7:00 pm. Click on the poster (below) to enlarge the image. Although SOHC is not a registered society and therefore is not required to make its records public, the executive feels that others would nevertheless be interested in our finances. Click here to see a copy (pdf) of our balance sheet as of May 24, 2014. In June, 2013, SOHC/UBC Okanagan were awarded a $5000 team building grant from Rural Health Services Research Network of BC (RHSRNbc) to initiate research into chronic illness and end-of-life care in Princeton. The grant was the result of a collaboration between SOHC and Dr. Barbara Pesut. The funds have been distributed to Dr. Pesut who heads the research team. A full report of the disbursement of these funds will be available from RHSRNbc at the completion of this initiative. In October 2012, SOHC received a $500 bursary from RHSRNbc to attend the Rural Health Services Research Conference in Kelowna. These funds paid the registration fees for two SOHC Executive members. Transportation, accommodation and meals were paid from personal funds. Again in April of this year, RHSRNbc provided a $650 bursary which paid for registration fees and one night accommodation for two SOHC Executive members to attend. All other expenses were paid from the members’ personal funds. We just got word from the Judge – key parts our evidence will be heard in the court battle to defend Canadian public health care! Dr. Rupinder Brar from Canadian Doctors for Medicare and Adam Lynes-Ford, BC Health Coalition at the BC Supreme Court on May 21. Our evidence will prove that Dr. Brian Day’s plan to bring US-style care to Canada will harm patients’ health, disrupt medical practices, drive costs up, and weaken the Canadian economy. We’ve been able to get this far thanks to your support. Now, we need to raise $100,000 to cover the costs of bringing this crucial information to trial. Can you help? The BCHC community represents over 600,000 people. If just 10,000 of us donate $10 each, we can bring this important evidence to court. Can you give $10 or more now? Dr. Day claims that the defining principle at the heart of Canadian Medicare – that health services be provided according to patients’ needs, not their ability to pay – is unconstitutional. If Day wins, the public health care system that Canadians rely on – and overwhelmingly support – will be effectively dismantled right across the country. “On Monday we’re going to court to launch our case for Canadian public health care, aiming to introduce some very important evidence about the devastating consequences of Brian Day’s attack on Medicare. For-profit clinic owner Brian Day has invoked the Canadian Charter of Rights and Freedoms to attack the very social program that best embodies the principles of fairness and equity the Charter stands for. Our evidence will prove that Brian Day’s plan to bring US-style care to Canada will harm patients’ health, disrupt medical practices, drive costs up, and weaken the Canadian economy. This challenge poses a huge threat, and is one of the most significant constitutional challenges in Canadian history. If Dr. Day wins, the public health care system that Canadians rely on – and overwhelmingly support – will be effectively dismantled right across the country. We are just four short months away from an unprecedented legal challenge to Canadian public health care that will put the fundamental Canadian principle of care based on need, not ability to pay, on trial. The legal case is being driven by Dr. Brian Day, owner of the Vancouver-based for-profit Cambie Surgery Centre, infamous for unlawfully billing patients for health care services. Dr. Day hopes to strike down the rules that prevent a U.S.-style system in Canada, where some people get to pay privately to jump the queue. 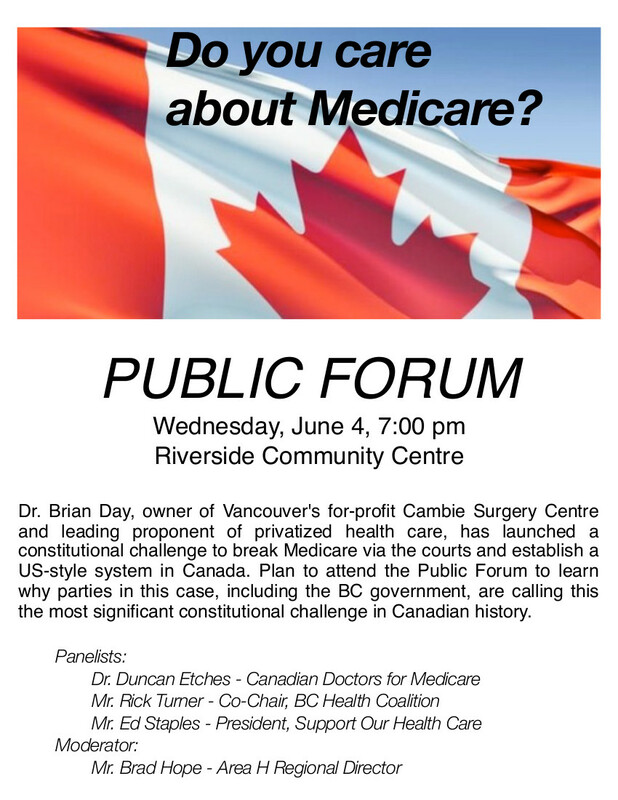 His claim is that B.C.’s Medicare rules violate the Canadian Charter of Rights and Freedoms.